Casio's best sound and action, revolutionary interface. Known as the Compact Grand Piano, the CGP-700 delivers groundbreaking technology, a sensational sound system and a world-class keyboard action that is perfect for aspiring and professional pianists alike. As a manufacturer of keyboards for over 35 years and consumer electronics for more than 65 years, the CGP-700 is the culmination of Casio's innovation and experience in these industries. Casio's CGP-700 provides the experience of a full-size acoustic grand piano at a fraction of the price. At the center of the CGP-700 is a beautiful 5.2 Color Touch Interface. The display is bright, clear and easy to read, and makes navigating tones and rhythms simple and intuitive. In addition to the display, the CGP-700™s front panel has a dedicated button for Grand Piano allowing you to access your primary sound instantly. Transpose buttons allow you to change keys without navigating a menu. The CGP-700 has a 40-watt sound system with four speakers in the top of the CGP-700 providing a rich stereo experience and two additional speakers located in the CGP-700's included stand for low frequencies. The CGP-700 also features a stereo input allowing you to listen to your MP3 player or other devices through the sound system. The CGP-700 features Casio's Tri-Sensor Scaled Hammer Action II keyboard, engineered to provide the touch of a concert grand piano, enabling young players to develop proper technique and advanced players to feel at home. Casio has scaled the weight of the keys to replicate the larger hammers in the bass register and smaller hammers in the treble register. To further the experience, the CGP-700 features simulated Ebony and Ivory-textured keys for an incredible feel. As one of the pioneers of digital sampling technology, Casio put its years of experience into reproducing the most important sound, the Concert Grand Piano. Casio meticulously recorded the sound of a world-class 9-foot concert grand piano. Casio's team recorded the piano at four dynamic levels, mixing each of the microphone positions until the ultimate piano experience was captured. The result is a grand piano sound that is dynamic, expressive and rich. The CGP-700 has 550 instrument tones including newly developed guitars, basses, drums, stereo string ensembles, synths and more. These instrument tones take advantage of the CGP-700™s powerful effects system, which include phasers for electric pianos, distortions on guitars, and rotary speaker effects for organs. The CGP-700 is a full ensemble digital piano with 200 built-in Rhythms, including drum patterns with fills, variations and full accompaniment. Tones, layers, splits, rhythms, accompaniment and tempo can be stored and instantly recalled. For performing musicians, the CGP-700 can be removed from its included stand. 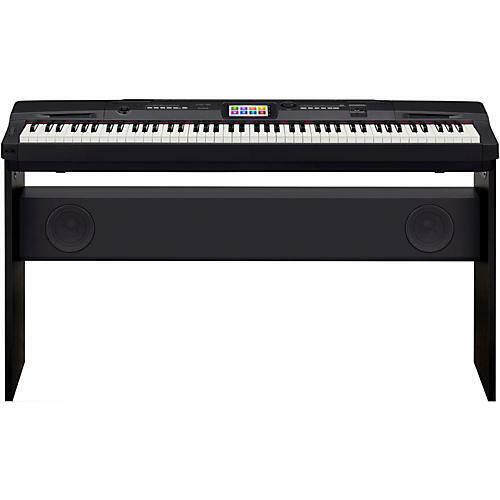 Without the stand, the CGP-700 weighs 26 lb., making it one of the most portable 88 key digital pianos available with a fully weighted keyboard action. In addition, the speakers in top of the CGP-700 work without the subwoofer system so you have speakers with you wherever you go. If you need additional amplification, connect to a mixer, PA system or keyboard amplifier using the ¼ outputs on the rear panel. The front panel of the CGP-700 has two headphone outputs located on the front of the instrument. When the headphones are in use, the internal speaker system is muted, allowing you to play and practice in privacy. Everything you'e playing on the CGP-700 can be recorded as a .wav file to a USB thumb drive. Equipped with Duet Mode, the CGP-700 can split the keyboard into two equal ranges allowing student and teacher to work side by side on the instrument. An additional Classroom Mode splits the keyboard and configures the CGP-700 audio outputs to work with third party piano lab systems allowing two students to use the CGP-700 simultaneously. The CGP-700 connects to your PC, Mac or other devices through a class-compliant USB port. Class Compliant means that the CGP-700 is designed to work with your computer without the need to download drivers. Just plug it into your computer and you are ready to use your favorite software. With the CGP-700™s aux stereo input, audio from your computer or tablet software can be experienced through the CGP-700™s speaker system making it a totally integrated solution. Featuring an easy-to-use Color Touch Interface, authentic grand piano sound, world-class keyboard action and a phenomenal sound system, the CGP-700 presents an impressive array of features delivered with cutting edge technology and exceptional value. Order today. This piano represents the best of Casio's research and manufacturing.